For the last couple months, our CSA box from Full Circle Farm has been full of greens: lacinato kale (cavolo nero), beet greens, curly endive, Swiss chard, radicchio, and lettuces. My favorite is the bag of mixed baby “braising greens” that Full Circle sometimes offers. The bag usually includes 3 kinds of baby kale, Swiss chard, and mustard greens. “Braising” is a method of cooking in which meat or vegetables are browned in fat and then simmered in liquid until done. 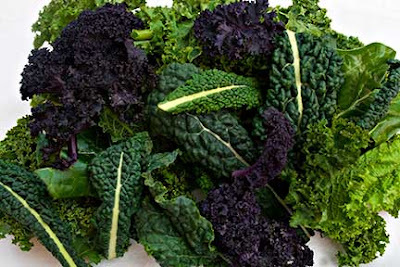 When raw, greens like kales and beets are usually tough and fibrous. Braising turns them soft and tender. Last week I wanted braised greens for dinner, so dug out bunches of lacinato and purple kales, plus a bag of baby braising greens. To balance the slightly bitter greens, I added onions and red peppers for sweetness, and finished the dish with chunks of chicken and plenty of herbs. The final dish was flavorful and filling; a feast for the eyes and senses. The kale’s curly edges trapped the herbs and cooking juices, and bathed our mouths with flavor. 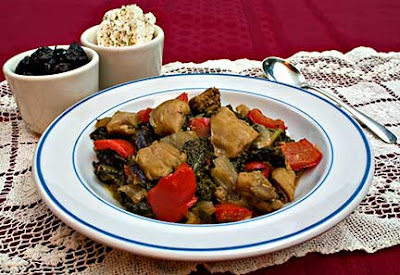 Leftovers: I made more Braised Chicken, Peppers, and Greens than the two of us could eat at one sitting. With the leftovers, I put together a wonderful soup by adding stock, beans, and seasonings. The soup took 5 minutes of mixing and 30 minutes of simmering; a perfect meal for a busy day. I prefer serving this on its own, but it is also good over pasta, rice, or mashed potatoes. For vegans or those who are fasting, this tastes great if you leave the chicken out or substitute white beans for the chicken. You can also substitute Italian sausage for the chicken. Adjust the amount of Aleppo or crushed red pepper depending on how spicy you like your food. If I know I’ll have leftovers, I make this using tough greens like kale, because they don’t fall apart or turn mushy when reheated. Wash the greens and remove the tough stems. Cut into 1 – 2” pieces. Cut the onions into 1 – 2” chunks. Clean and seed the bell peppers, and cut into 1 – 2” chunks. Cut the chicken thighs (or leftover chicken) into 1 – 2” chunks, and season with salt and freshly ground black pepper on both sides. Sauté the onions and bell pepper, lightly seasoned with salt and freshly ground black pepper, in olive oil until the onions soften and are translucent. Stir in the chicken, garlic, fennel seeds, and Aleppo pepper. If using raw chicken, cook just until the chicken starts to brown; if using leftover chicken, cook for one minute. Stir in the cleaned greens, and cook just until the greens start to wilt. Stir in the wine and vegetable stock, bring to a boil, turn down the heat, and simmer until the greens are tender. Stir the pot from time to time as it simmers to prevent the greens from sticking. This takes 15 – 30 minutes depending on the size and age of the greens; the only way to tell whether braising greens are properly tender is to taste them. When the greens are done, taste and add salt or freshly ground black pepper, as needed. Serve immediately with crusty bread and a crisp green salad. Mix all of the ingredients in a pot. Bring to a boil, cover, reduce heat, and simmer for 30 minutes. This is my entry for Antioxidant Rich Foods/5-A-Day Tuesday hosted by Sweetnicks. I am also submitting it for Leftover Tuesdays #11 hosted by Pam at Project Foodie. To think that people used to call these greens weeds? HAH!! I love horta for their flavour, healthy properties and taste. Oh my, those are some beautiful greens! I don't know which dish sounds more appetizing, the main dish or the yummy leftovers! They both look gorgeous! I can't believe you live in Alaska and get greens like that in January. I live in a mild climate and am lucky to find a bit of spinach! Great primer on freezing and thawing fish, btw. Hi there Laurie! Thanks for coming by my blog and saying those kind words, I really appreciate it. You have a cool blog too. Isn't food blogging fun? I'm really Loving it! Yum! Beans and greens may be a classic combo, but always satifies! Peter, sometimes I wish I'd named my blog Xorta R Us! Pam - you don't need to pick, make lots of the first so you have leftovers for the second! Glad you liked the fish piece! oh for the love of food, you are so welcome! your macarons were a vision! 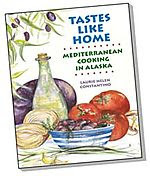 Lannae, it does always satisfy and is an easy fall back position when I'm stumped about what to make for dinner. I love beans! Wow, those greens are sooo GREEN! They look wonderful! I see your recipe has fennel seeds which I have just found a new love for! All sound so healthy! Yum! What beautiful colour those greens have in your top picture! And two scrumtuous dishes, I'll definitely enjoy both. Fresh greens during our cold winters are a godsend. I have to have fresh flavours! !As an aside to answer your question when my daughter and I were in Santorini we stayed in Firostefani at Hotel Ilias. We rented a quad and toured all around the island discovering some delicious restaurants and meeting many new friends. 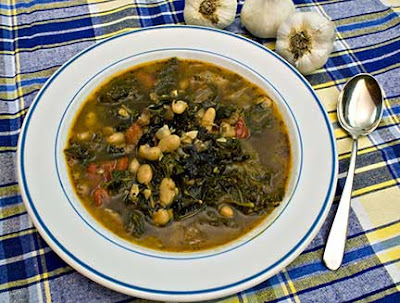 That bean and greens soup looks really good! It is always nice when you can use leftovers to make a dish that seems completely new. Thank you Ronell - all the shades of green are very appealing. If you try either of these, I'd love to hear how it came out. Valli, you are so right about greens in winter. Sounds like you had a wonderful trip to Santorini -- I especially liked the part about meeting new friends! Kevin, coming from you - The Leftover King - that is a great compliment! Thanks! This looks so soul-full and satisfying, and then to have a soup later, as well. Delish!